​Savage Jazz Dance Company will be performing at the 24th Annual Collage des Cultures Africaines! 1428 Alice Stree in Oakland! Catch SJDC at East Bay DANCES 2018! Hosted by Oakland Ballet Company, East Bay DANCES will feature a diverse line-up of East Bay-based dance companies and choreographers working in classical, folk, traditional, and contemporary styles. Oakland Ballet Company will also perform excerpts from the Scene and Heard spring repertory program. 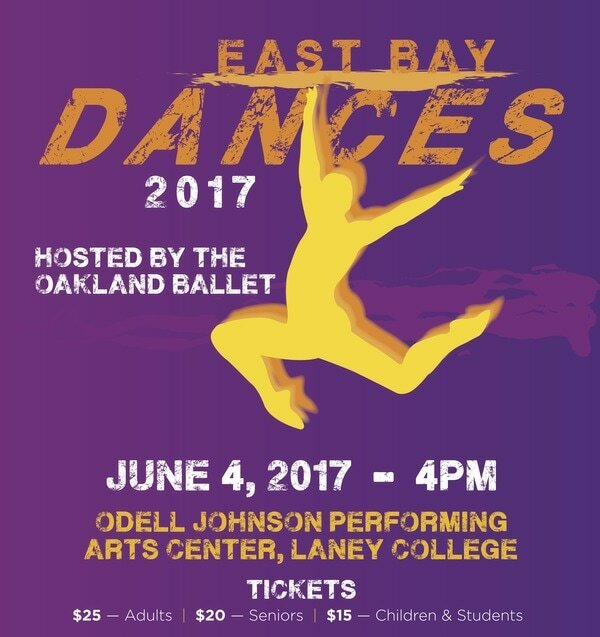 Catch SJDC at East Bay DANCES 2017! 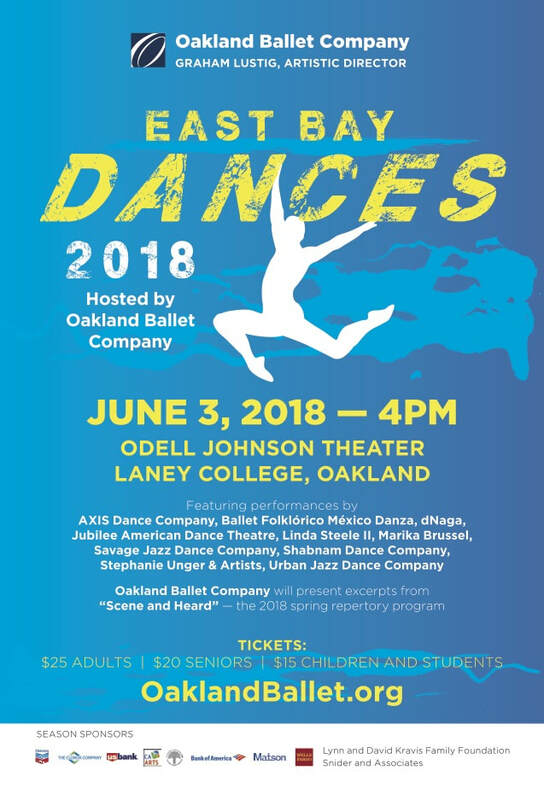 ​Oakland Ballet Company is excited to present the 3rd annual East Bay DANCES – an afternoon celebrating the very best of dance in the East Bay. 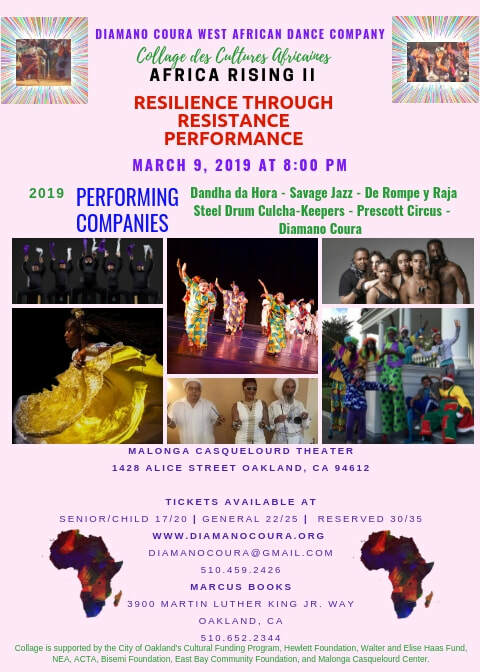 Featuring performances by Oakland Ballet, Ah-Lan Dance, AXIS Dance Company, Ballet Folklórico México Danza, Jubilee American Dance Theatre, The Milissa Payne Project, Savage Jazz Dance Company, Shabnam Dance Theatre, Van der Zwaan Dance Studio, and YuRue Ma! at Diamano Coura's 22nd Collage des Cultures Africaines. Ms. Taylor began her dance career Dance Theatre of Harlem where she was a principle ballerina. She danced on Broadway in The Lion King, Aida, and Carousel and was director of the Dance Theatre of Harlem School. She is currently Assistant Professor of Dance at University of Illinois at Urbana-Champaign. Come see her premiere on SJDC! Diamano Coura West African Dance Company Presents the 22nd Annual Collage des Cultures Africaines, an international African collaboration featuring four days of intense workshops in African drum. dance, and culture, an amazing performance, educational programs and more, representing the dynamism, vibrancy and diversity of the African Diaspora. Amazing drummers and astonishing teachers from Senegal, Guinea, Mali, Liberia, Brazil, Zimbabwe, and more will thrill audiences and bring to their feet with high kicks and acrobatic feats. Headline artists include Mahea Uchiyama, Chinyakare Dance Ensemble, Dimensions Dance Theater, Diamano Coura West African Dance Company, Savage Jazz Dance Company, Youssouf Koumbassa, Mabiba Bagne, Djaneba Sako and more in one night of mesmerizing performances, a pre-performance African marketplace and pre-show extravaganza. Join us at the 2016 East Bay DANCES festival - an afternoon celebrating the very best dance in the East Bay! Discounts available for Seniors, children, and students. Oakland Ballet Company will also perform excerpts from its spring repertory season production, A Cappella - Our Bodies Sing. 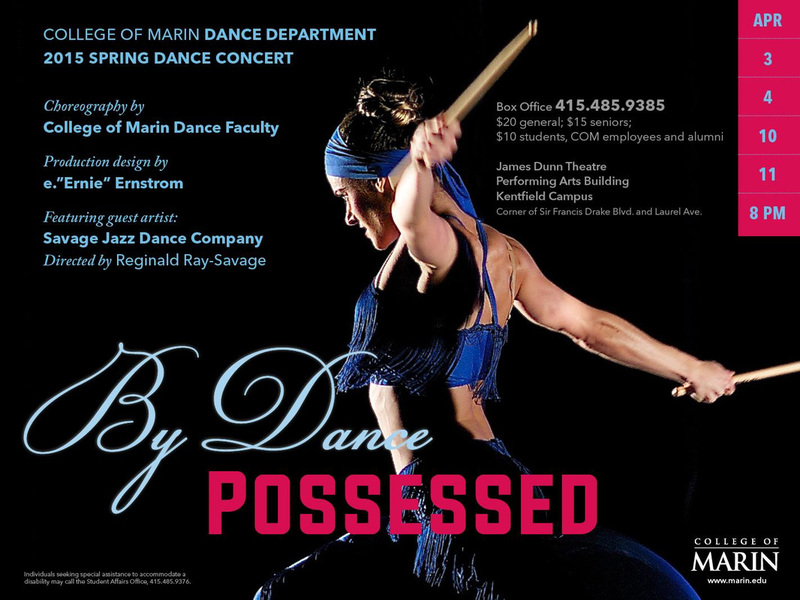 Savage Jazz Dance Company has been invited as guest artist at the College of Marin's Spring Dance Concert 2015. SJDC will present the haunting solo Spiegel im Spiegel (Premiere 2014; Marin County Premiere), choreographed by Artistic Director Reginald Ray-Savage, set to the music of Arvo Pärt at CoM's Spring Dance Concert 2015, By Dance Possessed. April 3, 4, 10, and 11 at 8pm at James Dunn Theater (835 College Avenue @ Sir Francis Drake Blvd, Kentfield, CA 94904). Mr. Savage choreographs world premiere on menlowe ballet! March 27-29 at the Menlo-Atherton Performing Arts Center (555 Middlefield Rd, Atherton, CA 94027). With great anticipation, Menlowe Ballet brings two stunning new works to the stage: a soulful thrill-ride, Bru’s Sweet, by Reginald Ray-Savage, Artistic Director of Savage Jazz Dance Company and Artistic Director Michael Lowe’s alluring neo-classical ballet, Playing Love, exploring relationships and the facets of love. The return of Lowe’s acclaimed cultural work Legend of the Seven Suns completes the program. 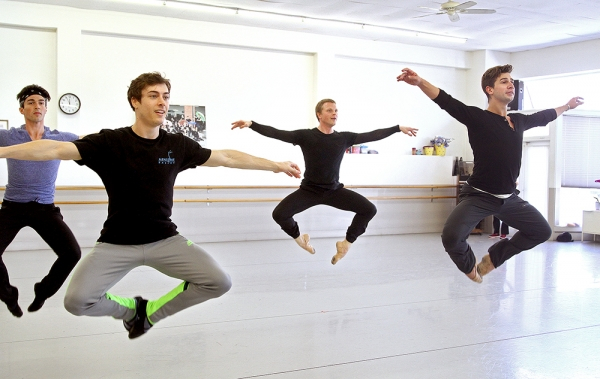 Check out this sneak peek video of Mr. Savage's Bru's Sweet in rehearsal! Playing Love (Lowe) and Bru's Sweet (Savage), featured in Menlowe Ballet's 2015 Spring Season, Rapture! Don't miss this spectacular program! Tickets for Rapture are on sale now! or by calling 800-595-4TIX (4849). Savage Jazz Dance Company will present the haunting solo Spiegel im Spiegel (Premiere 2014), choreographed by Artistic Director Reginald Ray-Savage, set to the music of Arvo Pärt at this year's Black Choreographers Festival 2015. SJDC will perform on February 28 and March 1 at Dance Mission Theater (3316 24th Street, San Francisco). OSA School of Dance Alumnus, by Tracy Martin. Savage Jazz Dance Company presents Fire from Julian Pham on Vimeo. Featuring World Premieres set to the music of Arvo Pärt, René Aubry, Ólafur Arnalds, and Philip Glass, as well as SJDC Repertory Classics with music from Alarm Will Sound and Leonard Bernstein, ﻿Fire﻿ is a contemporary dance celebration and homecoming, where past SJDC Dance apprentices, who were the first generation graduates of Oakland School for the Arts (OSA) School of Dance, and are now college graduates, come back home to dance as they are now - young, beautiful, black dance artists. They are not only continuously inspired by their teacher and mentor, Artistic Director Mr. Reginald Ray-Savage, but they are now also inspiring others, as young artists in their own right. These OSA School of Dance graduates and SJDC trained dancers represent a strong future. Also, with this production, we celebrate what would have been the 100th birthday of Archie Savage, Artistic Director Emeritus of the Savage Jazz Dance Company, whose invaluable guidance laid the Company's artistic foundation via his training, mentoring of, and friendship with our current Artistic Director. These young dance artists, in their strong presence of right now, in combination and synergy with long-time SJDC Dance Artist and OSA School of Dance teacher Ms. Alison Hurley are the spark that ignites the Savage Fire, from the music that is the fuel. This production is the zenith of the resultant energy. These dance artists are the next cycle of the passing of the flame and they themselves continue this practice with the next generation dancers. The Savage Jazz Dance Company continues the Fire of Archie Savage, the Artistry of Katherine Dunham, and the Vision of Artistic Director, Reginald Ray-Savage, their devoted student. a passioned and purposed life. Check out the "Savage Dance"
in Oakland, and for the people of Oakland and beyond. Don't miss this very special SJDC production! Tickets on sale beginning September 25. Savage Jazz Dance Company presents our long awaited 2013 Fall Season Production, celebrating and continuing over 20 years of dancing excellence! With this 2013 Fall Season Production, Savage Jazz Dance Company will present exciting World Premieres and repertory classics, featuring music from Wynton Marsalis, Philip Glass, and more.